Time and opportunity in short supply, I decided to wait a while before doing the newsletter... and what do you know... it's 2019 and an update from me is long overdue. We left Florida and traveled with the 5th wheel up to Wisconsin (grandbaby time!!) via Charleston, SC for a family (Paul & Kylie's) wedding which was great, lovely to see everyone again and spend some time with the happy couple! 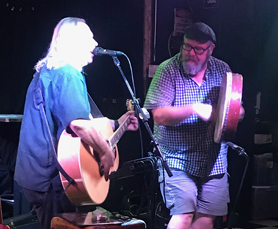 After a few gigs in WI (McAuliffes and House of Guinness - nice), we headed to Portland Oregon where we spent a month and played 10 shows ending with the Portland Highland games which was a lot of fun. While playing in the VIP tent, one man turned to me and told me "you made the games for me, I love the pipes, but you made this special" ... it's hard to beat that. With only two weeks in Scotland, there was only time to play the Orchar and the Clep bar... they were both really enjoyable - I'll need longer next time. After Scotland, we left on a trip of a lifetime to celebrate our 40th wedding anniversary with our great friends Fred & Cecile from the Netherlands who were also 40 years married a couple of weeks after us! We flew to South Africa where we went on a safari (fantastic) followed by 10 days in Cape Town (less animals and still fantastic). Back in Florida since late November, I've had a good series of gigs and am enjoying the warm winter here again. 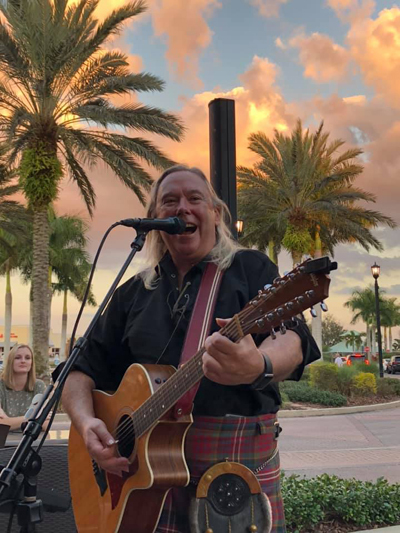 I'm becoming more established in Florida thanks to Demaris Woods of Derek Warfield and the Young Wolftones, she has introduced me to some good people and once I've played a place, they always ask me back for a repeat show, which then becomes a regular thing. That's nice. I learned a lot in Wisconsin, I learned how to be a loving granddad... that was easy. I also learned that it's tough to find work up there if you're not playing at a festival. There are big festivals each weekend. On top of that, each church (and there are a lot of them) has a fair, each club has an event... and as a result there's not much happening in the pub circuit. 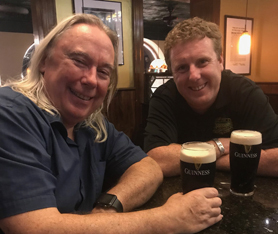 Thanks to Keith Kucharski of the House of Guinness and JJ McAuliffe of McAuliffe's of Racine I was able to keep playing through the visit there. 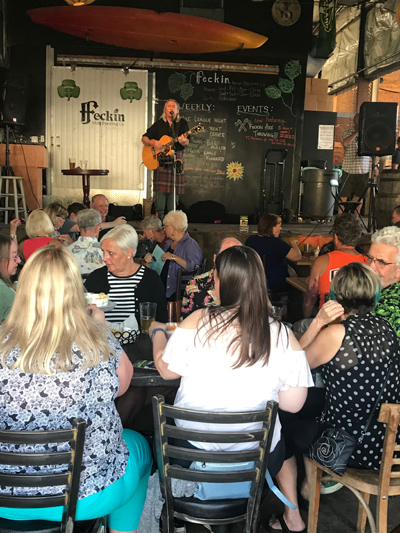 I'm already booked to play at the House of Guinness on November 9th 2019, hopefully I can convince festival organisers to come along to the show so I can have a Wisconsin Summer 2020 festival tour. For 2019, I'm playing steadily in Florida until June. 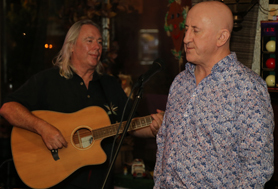 I do, however have a wee jaunt to Lake Havasu in Arizona to play at the first Paddyfest on March 15th, 16th & 17th for St Patrick's day on 17th. This is a big festival and it's thanks to Dave & Dave, the Black Donnellys, who are also appearing, for getting me on the program. In June I'll be off to Honolulu for a Hawaiian tour (June 17 to July 7-ish). I'll be playing at the AGM of the Caledonian society of Hawaii (thank you Nancy!) 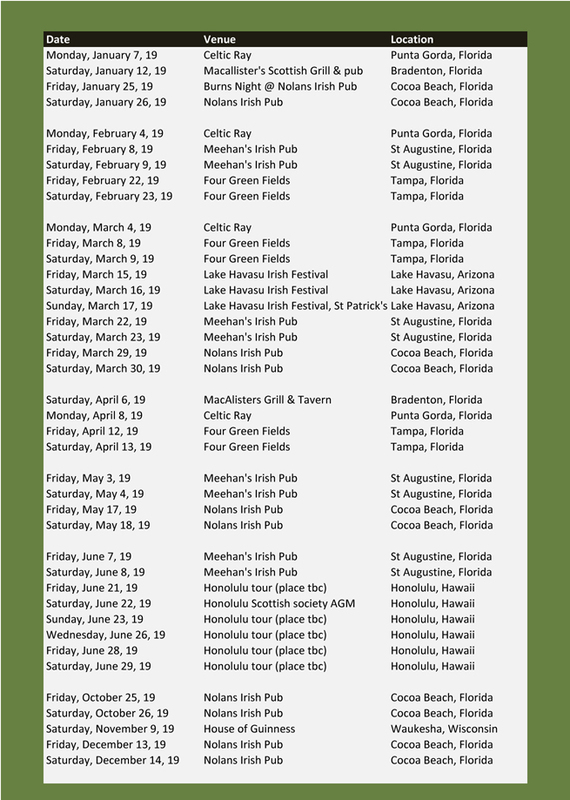 and will have five shows at the various Irish pubs there - thanks to Bill Comerford! We're tagging a week's vacation on the end of the tour and are both looking forward to meeting the good friends we met there in previous years. Our Summer plan is still coming together, but we're thinking that after Hawaii we will pop over to Portland, Oregon (July 8 to 22-ish), meet a bunch of good friends and play a bunch of good gigs (I'm still holding Sat July 20 in anticipation of playing the Portland Highland games). After Portland, we'll be back in Florida for a bit, have a visit to Wisconsin, then head to Scotland and the Netherlands for the rest of the summer, returning to Florida mid September. I'm open to traveling to WA for the Galway Bay festival in October and will be in Wisconsin some of November. That's the plan anyway... keep checking my website www.bill-mullen.com for news and we'll see in future newsletters why what actually happened happened. my website - you can see the previous newsletter updates going back to August 2014. Each new newsletter is archived there. For 2018, a big thanks to all the folks we met and had fun with along the way, all who bought my CDs, thank you for liking my show and my music. To all who booked me, for all who gave us places to sleep (no matter how sweaty), fed us, watered (and wine & whiskey'd us) thank you very much, you made it a great year. I have a bunch of pictures I gathered together to give you a taste of it, you can check them out here.